Alexus Paglinawan has been awarded the 2018 Rachel Leilani Gangwes Scholarship of $1,000. This scholarship was sponsored in partnership with Kealani Gangwes, in memory of her late sister, Rachel Leilani Gangwes, who was born with Edwards Syndrome (Trisomy 18). While most children do not live past their first birthday, Rachel persevered overwhelming odds to bless her family, friends, and community with eighteen years of love and joy. Rachel reminded everyone that every day is a gift with which you must do your best to uplift others, through words and actions. 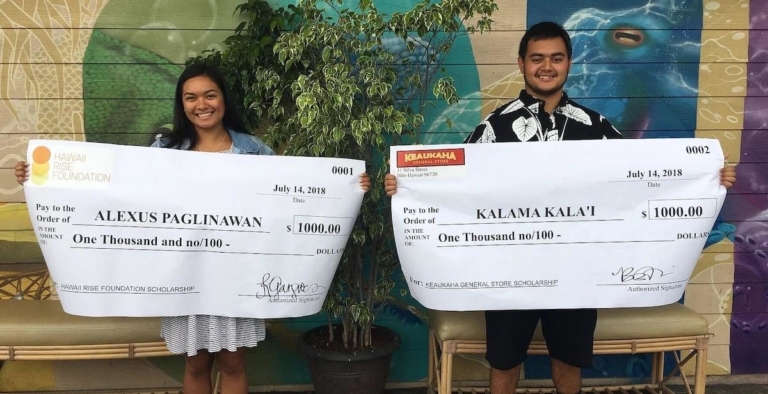 Keaukaha General Store has named Kalama Kala’i Morales as the recipient of their 2018 Holomua Scholarship of $1,000. This scholarship was sponsored by community partner, Keaukaha General Store. Kalama was awarded this scholarship in recognition of his commitment to “holomua” or to improve, progress, and move forward.